However, modern, well-functioning wastewater treatment plants seem to be quite effective in removing bacteria resistant to antibiotics from the water during the treatment process. Nevertheless, the study did indicate that it's possible for a treatment plant to function as an incubator of antibiotic resistance under certain conditions. Among the 12 plants studied, in one facility, the relative number of antibiotic resistance genes increased during the purification process. The study was conducted by an international research group. The University of Helsinki was represented in the study by microbiologist Marko Virta's group from the Faculty of Agriculture and Forestry. The results were published in Science Advances. European antibiotic use varies widely by country. Overall, southern Europeans use many more antibiotics than their counterparts in the north. 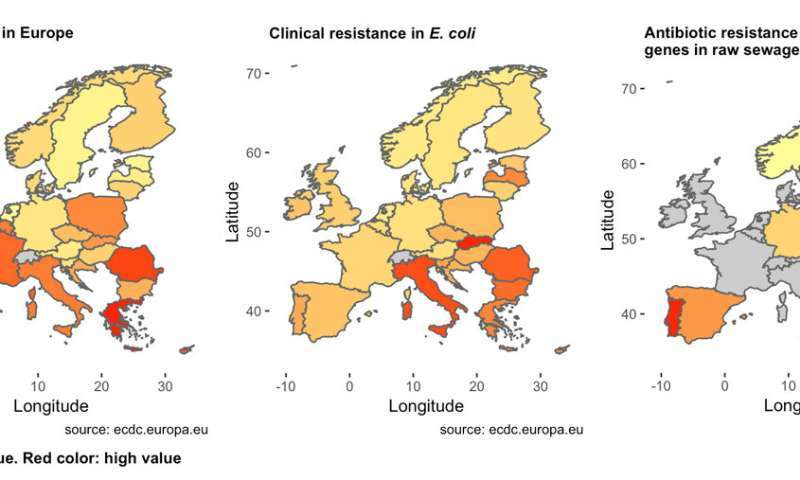 Similarly, people living in the south of Europe tend to carry a much higher number of antibiotic-resistant bacteria than those living in northern Europe. Among the countries in the study, antibiotic use is relatively high in Spain, Portugal, Cyprus, and Ireland, whereas in Finland, Norway and Germany antibiotics are prescribed and used less. The amount of antibiotic resistance in these countries mirrors the division above: the Spaniards, the Portuguese, the Cypriots and the Irish have more bacteria resistant to antibiotics in their bowels than do the Finns, the Norwegians and the Germans. All of the countries investigated in the study had various antibiotic resistance genes in the wastewater entering their treatment plants. The number of resistance genes found in wastewater bound for purification was higher in Portugal, Spain, Cyprus and Ireland than in Finland, Norway and Germany. "In this study, 11 of the 12 wastewater treatment plants under investigation mitigated the resistance problem, which seems to indicate that modern plants work well in this regard," Marko Virta says. "At the same time, an older plant or otherwise deficient purification process may end up increasing antibiotic resistance in the environment. We need more research findings from countries with high antibiotic consumption and less developed wastewater treatment practices." Virta's research group is currently initiating new projects in Asia and West Africa. This problem might particularly impact countries suffering from a lack of potable water since they are more prone to using purified wastewater for irrigation.